It’s the holiday season! That means it’s time to start thinking about holiday gifts. Of course you could always buy presents, but homemade gifts appear more thoughtful (and are more inexpensive)! Food gifts tend to be particularly popular, but if they’re pre-made there’s always the danger that they’ll dry out before you can give them to the recipient. 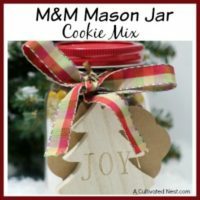 You don’t have to worry about that with this M&M Mason Jar Cookie Mix Recipe! This pretty looking gift is ready for your gift recipient to mix up whenever they want a fresh batch of yummy cookies! This Mason jar cookie mix recipe is the perfect gift when you don’t know what to give someone. After all, everyone loves food, and most people like cookies! 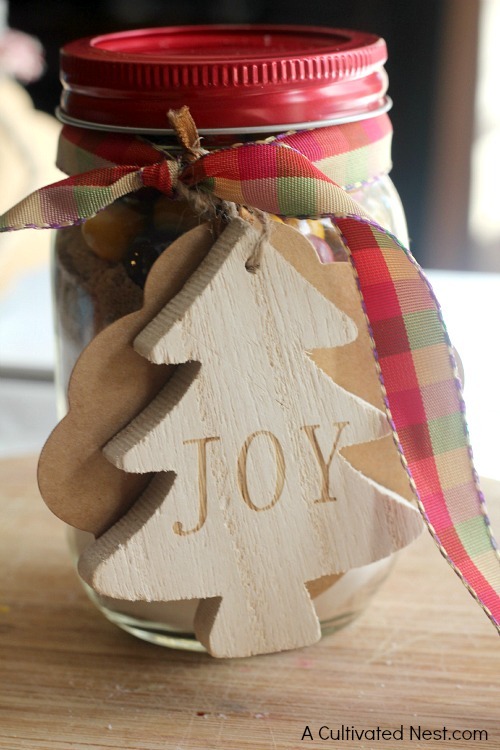 Even if the recipient doesn’t like cookies, they’re sure to appreciate the pretty Mason jar and Christmas ornament! In a pint size Mason jar, layer the flour, baking powder, baking soda, salt, M&M’s, brown sugar and sugar, packing each layer tightly. 1. Replace the original lid with the red lid. 2. 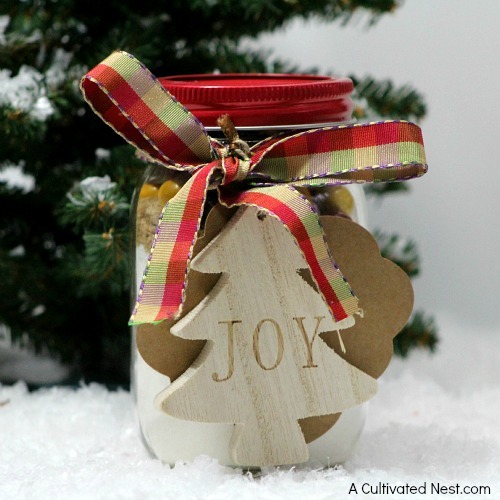 Take the ribbon and wrap around the top of the jar before cutting. You will want your ribbon to be 5 inches on each side after wrapping it around the lid. 3. Tie a knot with the ribbon. 4. Attach the card first by securing it to the ribbon. 5. Add the ornament to the ribbon. 7. Begin to create your bow. Use your scissors to trim the excess ribbon. You want your ribbon to touch the bottom of the Mason jar. 1. Empty jar of cookie mix into a mixing bowl, mix well. 2. Add 1/4 cup butter or margarine, melted, 1 egg, and 1/2 tsp vanilla. Mix well. 3. Roll dough into 1-inch balls, and place on a cookie sheet lined with parchment paper. 4. Bake at 375 degrees for 12 minutes. 5. Cool on cookie sheet for five minutes, then place on wire racks. 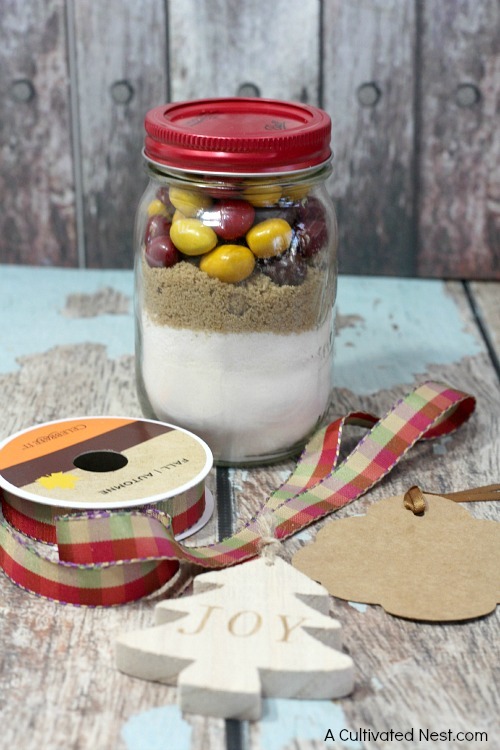 This M&M Mason jar cookie mix would make a lovely gift! Empty jar of cookie mix into a mixing bowl, mix well. Add 1/4 cup butter or margarine, melted, 1 egg, and 1/2 tsp vanilla. Mix well. Roll dough into 1-inch balls, and place on a cookie sheet lined with parchment paper. Cool on cookie sheet for five minutes, then place on wire racks. These look great, Manuela. Do you think it’s ok to go ahead and make them now to avoid the rush? If you keep it clean and free of water, I imagine it would last several months opened. So you could definitely make scrubs now to gift for Christmas. looks so cute all decorated up. Looking forward to trying it. What a beautiful gift to make:) Thanks for sharing! Have a blessed day, HUGS! Pinned this great idea! Thanks! Stopping in from Ducks n a Row hop. So glad you like it! Thank you for pinning, I appreciate that! Cool! I love mason jar recipes, they make great gifts. Thanks for sharing your recipe. Love the little tree ornament too. Pinning to my recipes in a jar board. 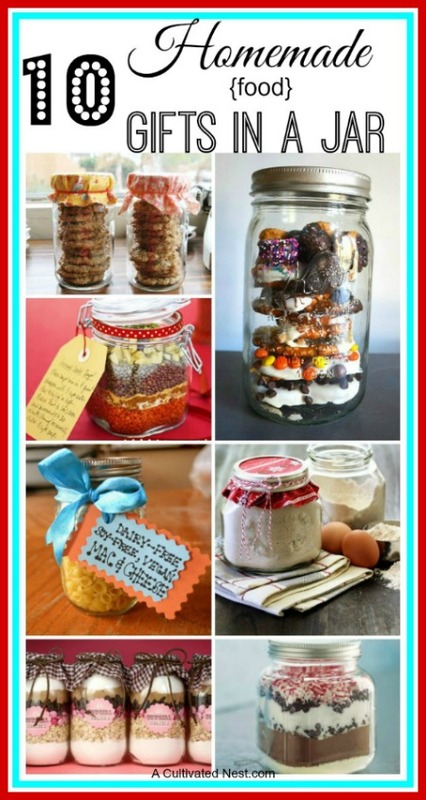 Pinning your 10 homemade food gifts in a jar as well. Thank you! They do make great gifts all year long! Thank you so much for pinning!